BRIC-if you are interested in global frontrunners (Brazil-Russia-India-China) of rapid development, then you’ve got to start with Brazil. Key to understanding the direction and spirit of the country, a window into this might be Brasília, the new capitol of Brazil created in 1960. The first city designed to be seen from the air, the city is also built in the shape of an airplane. What is its destination? Rio de Janeiro will host the 2016 Olympics and the World Cup too; it’s a glamorous city of legendary beaches with even more legendary bikinis. The former capital, Rio is not Brazil’s largest city (that would be Sao Paulo) but it’s the place most people think of first. Rio’s beaches may have, in part, been the reason why Brazil decided to move the capital from the port to an inland location. Shortly after Rio de Janeiro became the seat of the government (in the late 18th century), officials began talking about advisability of moving the capital to eliminate the potential danger of naval invasion and attack. Later, Nigeria would make a similar decision regarding its former capital, the port of Lagos, to found a new capital, Abuja. After the founding of Brazil as an independent political entity in 1822, Jose Bonifacio made official the decision taken to build a new capital and to name it Brasilia. But where to build it? That would take 50 years and a dream. Dom Bosco, founder of the Roman Catholic Salesian Order, had a prophetic dream that predicted a town between parallels 15 and 20. Even before the new city was built, a shrine was sculpted and dedicated to St. Dom Bosco; it is directly on the 15th parallel. Ultimately, there were three reasons to move the capital to the area of which the saint dreamt. First, the territory was inland, not vulnerable to naval attack. Rio remained vulnerable, and coastal attack would devastate the vibrant economy of the port, still at least government could function if the center of administrative direction was securely inland. Secondly, the new capital location had a requirement of abundant water because as the center of government, it was going to be big to start with and would likely grow; the area chosen offered excellent water resources. Third, it was politically and economically favorable to bring focus to the country’s interior; a similar reason for Nigeria’s new capital. But the idea took time, even though the region chosen was certain from the beginning. In 1889 Brazil abolished the monarchy. Two years later, the Constitution of 1891 mandated a new capital to be built on the Planalto Central. Still nothing really happened until a presidential candidate promised, in a campaign speech in 1955, to build the new capital on the plateau, if elected. Juscelino Kubitschek de Oliveira won the election, and in April 1956, he fulfilled his promise. He proposed a bill establishing an agency to carry out the creation of a new federal capital, named Brasilia, in a new Federal District to be built out of Goias State. In September, the Brazilian Congress approved the bill. By April 1960, the Plaza of the Three Powers was dedicated. In a small office at Cornell University, a graduate student peered at photographs taken from an airplane. “Was that limestone in one area? What would be the implications of building there? What does that shadow mean? Perhaps the boundary between two types of soil? How deep is the soil atop the bedrock? What are those white dots all over the field? What are they shaped like cones?” (Building the World, p. 559). Hollister Kent was the doctoral student. During World War II, young Kent was assigned to the 10th Mountain Division of the United States Army and was trained to read aerial photographs. Kent returned to study architecture at Cornell and was hired as an assistant to his professor, who happened to be working on a new capital. Soon, Kent was analyzing images but he had no idea of the view from the ground. When his boss was suddenly unable to go to Brazil for the project, Hollister Kent was sent. What he saw was the constructing of a dream. Brazil engaged architect and visionary Lucio Costa to design the new capital. His proposal reads like a poem as he describes a new city “born of a primary gesture of one who marks or takes possession of a place, two axes crossing at right angles, the very sign of the Cross.” Costa began in 1957 and within one year, the streets were laid out and completely paved. Lucio Costa’s map of Brasilia, 1958, from Library of Congress at loc.gov. Costa planned and specified every aspect of the new city. Consider as example Costa’s mandate that all taxis would be the same dark grey color; even bus drivers’ uniforms would include a dark grey cap that conveyed a sense of respect. For the buildings, Costa hired one of his favorite and oldest students, Oscar Niemeyer who designed the Congress, the University of Brasilia, the Cathedral and the Chapel of Our Lady of Fatima, as well as center of Justice, aptly called the Palace of Justice. Costa and Niemeyer both bowed to Le Corbusier with whom both had worked building the Ministry of Education and Health in Rio. Costa was the job boss, and Niemeyer worked under him but they both worked for Le Corbusier whose design, when completed in 1936, was lauded around the globe, elevating Costa and Niemeyer to a level of fame that made them the dream team for Brasilia. Brasilia could not have been built without the indigenous Canango people, who played such an important role in developing the new city. When Brasilia was dedicated in a ceremony at 9:30am on April 21, 1960 and the seat of government of Brazil was officially transferred from Rio to Brasilia, a sculpture in the very center of the new city, created by Bruno Georgi, was unveiled and continues to recognize and thank the Candangos. Later, when Brazil and Paraguay built their shared hydroelectric facility on their shared river, it was named after the indigenous Guarani people and their name for the “singing stone” of Itaipú. Composer Philip Glass and librettist Daniela Thomas created an opera of the same name based on Guarani Indian text. 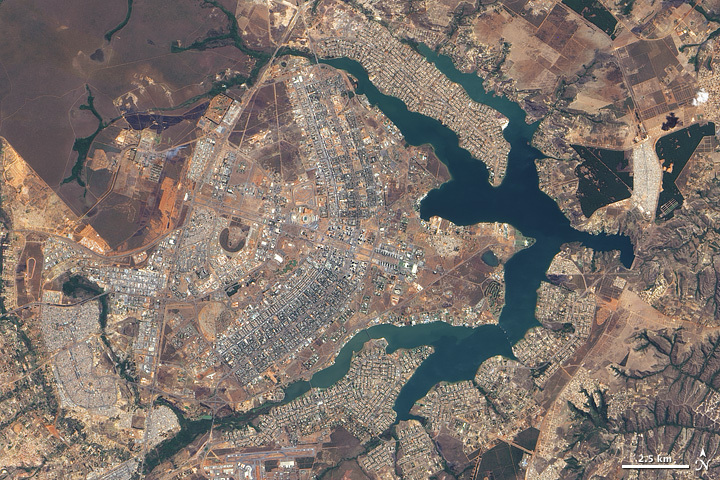 Chosen partly for its water supply, the area around Brasilia is running dry. As the population exploded, people began to tap into the water supply. By 2001, there were more than 2,300 secret wells. It’s the same thing that happened in the days of the Roman aqueducts. But this time, there seem to be unanticipated consequences. It is now known that shifts and stresses in underground water deepen cracks in earth’s tectonic plates. Once the plates are disturbed, they may shift — causing earthquakes. Seismologists continue to warn that water and tectonic plates interact. There was an earthquake of 3.7 on the Richter scale in Brasilia in 2001. A troubling question plagues the planners: could water have been part of the cause? With World Bank estimates that waste generation in South America will double by 2025, will water continue to be of great importance? What can be done now to prepare for the quarter-century global environment? Beginning at the point of lat. 15 degrees 30’S. and long. 48 degrees 12’W Greenwich. From this point it continues toward the east along the parallel of 15 degrees 30’S until meeting the meridian of 47 degrees and 25’W. Greenwich. Etc. (a) To constitute, in terms of this law, a corporation that will be named “Urbanizing Company of the New Capital of Brazil” (Companhia Urbanizadora da Nova Capital do Brasil or UC)etc. (g) To install in the future Federal District, or in the neighboring towns, services of the civil and military organs of the federal government to which public servants are to be allocated, in order to create better conditions for the development of the construction work of the new City. Single Paragraph. At the appropriate time, the National Congress will deliberate regarding the day of the move of the Capital, thus repealing Article 6 of Law No. 1,803 of 5th January 1953. 135th year of the Independence and 68th year of the Republi. – From Diario Oficial, Year 95, No. 217, “Federal Capital,” September 20, 1956. Translated from Portuguese by Christine Boedler. New Capitals and Federal Districts: Brasilia followed the example of Washington D.C. – a separate entity serving as capital in a reserved section of the nation that is not connected to the country’s largest city. Might Brasilia’s model serve as an example for relocation of capitals and federal districts in cases where the current capital is also on a tectonic fault? For example, Mexico City? Indigenous National Treasures: Brasilia recognized the Candangos, the indigenous people who not only were displaced by the new capital but also helped to build it. But what of their culture, their songs, legends, their knowledge of herbs, waters, spirit? Can the world be inspired by Gilberto Gil, Grammy-award winning musician and former Minister of Culture of Brazil, who placed webcams in the Amazon jungle to open a window into Brazilian cultural treasures. How can our world preserve and protect indigenous national treasures? New capitals: Washington, D.C. may have set a future direction for a center of government that is separate from a country’s largest city. Brazil made that same decision; Nigeria would soon follow suit. Are there other nations that might do well to consider such a move? What about countries whose capitals happen to have been built before the science of seismology could warn of dangers. For example, Haiti may have taken longer to recover from the recent earthquake because the capital, the seat of government, collapsed along with much of Port-au-Prince. (Building the Future, chapter on “Cities”). What about Mexico City, one of the world’s most populous capitals, that is on a tectonic fault zone as well as near a volcano? It was a volcano that saved the Panama Canal from being built in what could have been a tragic location. Should countries whose traditional capitals remain in danger zones consider new capitals such as Brasília? De Beauvoir, Simone. La Force des Choses. Paris: Gallimard, 1963. Kent, Hollister. “Vera Cruz: Brazil’s New Federal Capital.” PhD dissertation, Cornell University, 1956. Copies can be obtained from University Microfilms International, Ann Arbor, Michigan, USA. Little, P.E. Abundance is Not Enough: Water-Related Conflicts in the Amazon River Basin. Brasilia: University of Brasilia, 2002. Neimeyer, Oscar. Oscar Niemeyer: Notebooks of the Architect. Brussels, Edition CIVA, 2002. Ramos, A.R. The Predicament of Brazil’s Pluralism. Brasilia: University of Brasilia, 2002. For photos of Brasilia and the public archive of the Federal District, http://www.geocities.com/thetropics/3416/minis_ic.htm. For a history of Brasilia, http://www.infobrasilia.com.br/. 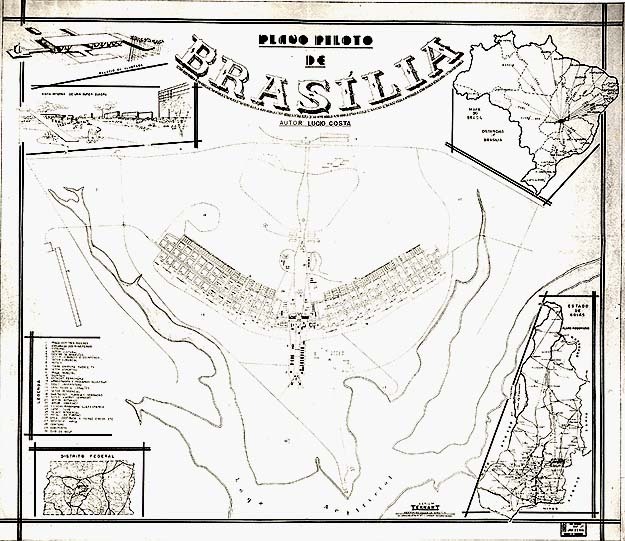 To see the complete document of Costa’s pilot plan for Brasilia, see http://www.info-brasilia.com.br/pilot_plan.htm.